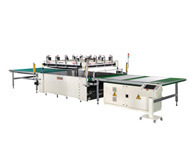 CHINUP is one of global leading manufacturers of the cutting equipment. We work closely with many global famous companies to provide them custom-built systems. CHINUP plastic card processing equipment was sold to many certified companies to produce the smart cards such as VISA, MasterCard, China UnionPay, American Express, JCB and Diners Club. We are taking high global market share rate in the field of the cutting equipment. Your visiting at our exhibition booth will give us a great opportunity to serve you in the future. Look forward to seeing you there! China sales division for plastic card: Please contact Mr. Edison Ku at "18912187862@126.com or mail@chinup.com.tw "